Eight of the officers shown here accounted for a total of 1,486 aerial kills. 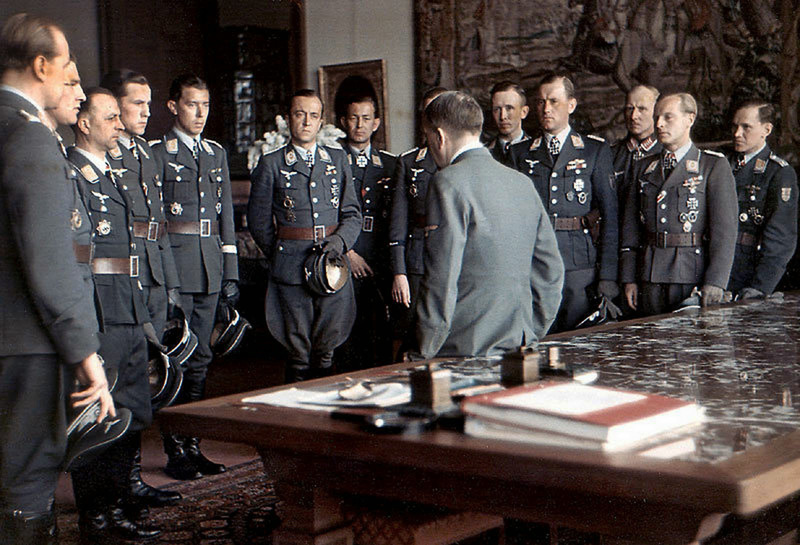 Adolf Hitler chats with his flying aces from Luftwaffe after an awards ceremony (Eichenlaub and Schwertern) at Berghof Obersalzberg on April 1944. All these Luftwaffe officers aces received their Knight’s Cross of the Iron Cross of Oak Leaves or Swords or Diamonds, the highest award made by Nazi Germany to recognize extreme battlefield bravery or outstanding military leadership. Eight of the officers shown here accounted for a total of 1,486 aerial kills. Only two of them went missing in action, and most lived until the 1990s/2000s. 1) Oberst Werner Streib – Luftwaffe night fighter. He was officially credited with shooting down 66 enemy aircraft, with 65 claimed at night. He was the first night fighter pilot to be honored with the Knight’s Cross of the Iron Cross with Oak Leaves and Swords. 2) Major Gerhard “Gerd” Barkhorn – Luftwaffe day fighter. He scored 301 victories, achieved in 1,104 missions; all his victories were won on the Russian Front. Despite being the second highest scoring pilot in aviation history, Barkhorn was not awarded the Diamonds to his Knight’s Cross with Oak Leaves and Swords after achieving his 300th victory on 5 January 1945. 3) Generalmajor Erich Walther – Commander of a Fallschirmjäger regiment (paratroopers). He was a recipient of the Knight’s Cross of the Iron Cross with Oak Leaves and Swords. Promoted to Generalmajor on 30 January 1945 he was taken prisoner of war by the Red Army on 8 May 1945. Erich Walther died at Soviet Special Camp 2 on 26 December 1947. 4) Oberstleutnant Kurt Bühligen – Luftwaffe day fighter. By 1944 he had shot down his 100th victim. While flying over Soviet held territory his engine malfunctioned and he was forced to land. He was captured by the Russians and held as a POW until 1950. He had scored a total of 112 victories. 5) Oberstleutnant Hans-Joachim Jabs – Luftwaffe day and night fighter. 50 victories. Jabs flew variants of the Messerschmitt Bf 110 Zerstörer heavy day fighter and night fighter. 6) Oberstleutnant Bernhard Jope : Luftwaffe bomber pilot. Recipient of the Knight’s Cross of the Iron Cross with Oak Leaves. Jope flew the Focke-Wulf Fw 200 “Condor” on missions across the North Sea and Atlantic Ocean in support of the Kriegsmarine. 7) Major Reinhard Seiler – Luftwaffe day fighte. He was credited with exactly 100 victories during World War II, over the course of about 500 combat missions. He recorded an additional 9 victories during the Spanish Civil War. In total 109 victories. 8) Major Erich Hartmann ( hidden by Hitler) – Luftwaffe day fighter. Nicknamed “Bubi” by his comrades and “The Black Devil” by his Soviet adversaries, Erich Hartmann is the most successful fighter ace in the history of aerial warfare. “The Blonde Knight of Germany” flew 1,404 combat missions and participated in aerial combat on 825 separate occasions. He claimed, and was credited with, shooting down 352 Allied aircraft—345 Soviet and 7 American. During the course of his career, Hartmann was forced to crash-land his damaged fighter 14 times due to damage received from parts of enemy aircraft he had just shot down or mechanical failure. Hartmann was never shot down or forced to land due to enemy fire. Hartmann claimed, that of all his accomplishments, he was proudest of the fact that he never lost a wingman (Gunther Capito was shot down but survived). He received Knight’s Cross of the Iron Cross with Oak Leaves, Swords and Diamonds on 25 August 1944 for claiming 301 aerial victories. At the time of its presentation to Hartmann, this was Germany’s highest military decoration. 9) Major Horst Ademeit – Luftwaffe day fighter. He was credited with 166 victories in over 600 missions and recorded 164 of his victories over the Eastern Front. He was posthumously promoted to Major. 10) Major Johannes Wiese – Luftwaffe day fighter. was officially credited with 133 victories claimed in 480 combat missions. Additionally he had 75 more unconfirmed claims. Among his claims are 70 Il-2 Stormoviks. Soviet fighter pilots therefore greatly respected Wiese, and referred to him as the “Lion of Kuban”. 11) Wachtmeister Fritz Petersen – Flak commander. He receiver Knight’s Cross of the Iron Cross with Oak Leaves for extreme battlefield bravery. 12) Major Dr. Maximilian Otte – Luftwaffe Stuka pilot. He was killed on 20 May 1944 by Soviet flak during the First Jassy-Kishinev Offensive. During his career he flew 1179 missions. 13) Hauptmann Walter “Graf Punski” Krupinski – Luftwaffe day fighter. He was credited with 197 victories in 1,100 sorties. He was called by his fellow pilots Graf Punski (Count Punski) due to his Prussian origins. Krupinski was one of the first to fly the Me 262 jet fighter in combat as a member of the famous aces squadron JV 44 led by Adolf Galland. Are we trying to proudly spread positive images of the "aces" of 1944 Nazi Germany visiting the Commander in Chief? Just reading the description of those Air Force officers and their "accomplishments" makes me feel full of rancor and disgust. To me it smacks of cheap Julius Streicher propaganda. I'm wondering what went through the person's mind that chose to post this picture? I hope he/she will also post a similar picture with the British, American and Russian "aces" as part of "Rare Historical Photos" together with an apology for this blunder.. The best if the Luftwaffe, meeting the leader of their nation, engaged in a world conflict against overwhelming odds. Adolf Hitler is bowed,with obvious fatigue. But the power of his presence ,and brief, has these amazing aces rapt concern and attention. 'Apology for blunder?'. For showing real history ,without sanctimonious, Allied propaganda? Get used to the truth. This is the free internet,still untainted, by the controlled,mainstream media. Nor is it,'worthy of Julius Streiker,'who had nothing to do with the Reichs Publicity machine,or this photograph. The time for morality play, history presentations, is coming to an end, and years of brainwashing, is coming to an end for the wise,and intelligent. What's the difference to the "heroes" of the allies? Please tell me, oh great bearer of the one and only truth and morality. And please tell me why there are monuments for monsters like "Bomber Harris" in britain. Bomber Harris was a robot-like military man that only knew to hate the Germans (with right) and punish them as much as he could, but Churchill despised them not less and is still considered an outstanding politician, for sure thousand times better war time leader than Roosevelt. This is not what I wanted to reply about, I wanted to tell this lost soul what the real and only truth is out there:when people organize themselves to manage a society in such a way and fashion that all the different opinions are being heard and genuinely debated before the Management makes decisions that involve and benefit all the members of the society. This is called DEMOCRACY and after humanity having tried very many other forms of management or self governing in the last 5-6 thousand years we are in the condition to say with certainty that this is the best for a society, by far. Of course there will be elements that don't see it this way and will even try to sabotage such successful and beneficial societies. Here we have what's right and what's wrong:, the ones that believe in Democracy are right (like bomber Harris or Generals Montgomery and Patton) while we have those that are wrong , the saboteurs or such names like Erich Hartmann, Rudolph Höss and Reinhard Heydrich. Now you will know how to distinguish between what's right and what's wrong otherwise I will wish you to live only 3 month in 1937 Germany and see how long would you last walking freely the streets after such sarcastic comments as yours above. Yet the Western Allies supported Stalin who committed even more heinous crimes against humanity than Hitler. He managed to kill more than 20 million people in his purges, while the nazis stand at 8-9 million plus the enemy casualties. Stalin's rule and terror on other European countries lasted longer than the nazis', and even after his death. Soviets enslaved countries and nations for more than a generation, yet Nazis are kept worse. Oh, and before there'll be any ranting of being some kind of pro-nazi, my grandmother, her sisters and mother had to flee nationality-based persecution from the USSR (they were ethnic East Carelians who didn't speak Russian well)- their neighbour came to warn them that OGPU (Soviet internal security police, their "Gestapo") was coming to arrest them. Her father had already been sentenced to a forced labour camp three years before for "anti-revolutionary" opinions (for not being willing to give away their 3 cows and a horse), but he had managed to flee from the train and finally from USSR. The remaining family was persecuted with unreasonable amounts of forced labour (small girls and their now-single mother were supposed to cut 3 tons of logs with all the work on the fields, for example) until they decided to flee at the last moment possible. There were far worse fates with the people in the area, my grandmother's aunt's family tried to flee also, but her small children were taken prisoner and executed, but she was let to flee. To the collapse of the USSR, only one descendant of my grandmother's relatives who decided or were forced to stay in the USSR had survived. And the Western Allies supported that monstrous rule. Not everything is as black and white as it seems - sure, the nazis deserved their defeat, but that meant half of Europe being enslaved by the Soviets, and the Soviet crimes being disregarded completely. The average German soldier or even their aces were no more evil or worse than their Allied counterparts. Johif, it's not that Western Allies supported Stalin, it's reality that leads the politicians. To gang up against Germany and start pushing from two sides forcing them to retreat is one thing and starting up with the largest country in the world is something else.This largest country is also very well armed and has a fierce battling spirit. I agree with you, many instances in life are not so black and white as they seem but I reject your last line: you cannot compare an army or it's soldiers when they go on offensive with an army that is out only to defend. These are two very different frames of mind. History is written by the victors. There are plenty of photos,storys,etc. If you want to read about the allies and their victories just look anywhere. Have fun getting sick reading this if you like also. Unfortunately British, American, and Russian aces never matched up to their German counterparts - be it air, tank, or deep, Germans routinely have 4 times the number of victories compared to allied forces. As part of the German strategy individual heroes were greatly celebrated. This isn't a celebration of Nazism or an admittance that the Aryan race is superior, it's just history. I understand, of course this is just history, who cares about this primitive animal called Mike Tyson while he was competing as an athlete, he won against everyone and every time and he will go into history among the greatest. By the way, this other guy, he was a good neighbor and a good friend, a good son to his parents who loved and cherished him and was very well mannered and peaceful. History will remember him as such, right? His name was Jeffrey Dahmer. jeez calm down. this site called rare historical photos so it covers both side of ww2. on't patronize me, don't tell me what to do, you're not my father, my shrink or my tutor, just keep on the contents of this discussion and don't get personal or it will show right away that your brain doesn't have the capacity to focus on 1 item only. In a war there are no 2 sides, ever: 1 is the wrong side and the other is the right side, that simple. Learn and write it down for yourself so you can think about it. Thank you for letting me know the name of this site (capital letters) but you got it wrong again: because the pictures are rare doesn't mean they have to show the side of the loosers. They can be rare by showing unknown shots of the victors as well. Of course, if your goal is to wake up the interest of the ignorant about the good side of the loosers, then yes, you can make believe these guys were good. For sure they were talented, intelligent and devoted. Can you name 8 American pilots that brought down 1500 killings?? March 1944. Erich Hartmann, Gerd Barkhorn, Walter Krupinski and Johannes Wiese were summoned to Berchtesgaden, Barkhorn to get his Swords, the other three to get their Oak Leaves. On the way, the four of them were drinking cognac and champagne on stomachs that hadn’t seen food in two days. Krupinski later said that they were "holding each other up" when they got there and with all the snow that was on the ground at that altitude, this group of the Luftwaffe's finest was hardly able to stand. The first person they saw when they got off the train was Hitler's Luftwaffe adjutant, Major von Below who was rather shocked at their condition. After all, they were supposed to meet the Fuhrer in just a couple of hours. When they arrived at Berchtesgaden Hartmann, who was still “feeling no pain” and was having some vision problems, couldn’t find his hat, “…so I took a hat on a stand and put it on, and it was too large. I knew it was not mine at that time. Below became upset and told me it was Hitler’s, and to put it back. Everyone was laughing about it except Below. I made some joke about Hitler having a big head, and that it must 'go with the job,’ which created even more laughter." So we ban all photos of the Axis? Maybe ban all photos of non-democracies? On No.8 "Major Erich Hartmann (hidden by Hitler)"
What does the "hidden by Hitler" mean? Sorry if this is obvious. If you look carefully at Hitlers figure you'll see the right shoulder and arm of a person that's been covered by Hitler himself. That is murderer Hartman that was shooting down with pleasure and excitement as many American and British warplanes as possible. He's been idolized here on this website as an "ace" of the air war. Hartmann fought exclusively on the Russian front. All his kills were Russian. He surrendered to the Americans who promptly turned him over to the Russian's who kept him in prison for ten years. That is indeed a stupid comment! First of all, Russia was an allied country to the US therefore it doesn't make any difference in a kill. Second, your information is not accurate as Hartman downed at least 8 US aircraft P-51 over the oilfields of Ploiesti, Romania during several combats in mid 1944. Third, don't spread misinformation if you can't be historically honest. Just keep quiet, and better spell your name correctly. that "alliance" worked out so well. stupid, venal politicians elected by idiots hand us death, destruction and cr@ppy economics. fortunately today we can see it all unfolding as we write as more and more historical truth is revealed on this vast, uncensored, freedom- and liberty-based, innovation-engine called the internet. see what unrestricted commerce has given us. rejoice and realize that it's government manipulation by force of commerce that warps everything. @Roscoe Ah, thank you. I see that now. In September 1940 Hitler initiated the "Blitz" by bombing relentlessly day and night London itself for over 8 months. Consider that at the time not Berlin nor Washington were bombed. In Britain WC was in charge of the British Navy as Chief of the Admiralty leading a fierce sea war against Germany's U-boats and its war ships. In May 1940 WC becomes Prime Minister following Chamberlain's resignation. As you can see WC was from the very beginning very much involved with the war efforts and also leading the defense of the British Isles and the rest of the vast empire. In this period WC is going several times from London to Washington DC to beg, implore FDR to help Britain in this war but always to no avail. Only after Pearl Harbor in December 1941 the US entered the war intervening on the European continent after the invasion and occupation of France by the Germans. This required a second step, “Operation Torch” which the Americans fulfilled successfully together with the British in North Africa. Then started an argument between WC and FDR about the next step which was again won by WC through the subsequent “Operation Husky” in Italy. The February 1945 Yalta Conference was the ultimate proof of how politicians operate; WC was only interested to lash out at the Germans, FDR was worried about his health and Stalin wanted to grab as much land as possible, which he did. Just few month later FDR was dead and WC ousted from the government by losing the elections. Some say that various points of ideological and strategic difference arose between the two leaders – most notably the shape of the post-war world – but it is indisputable that the two countries they led shared the same fundamental commitment to cooperate in order to rid the world of international fascism……..or I got it wrong? Who supported Batista, Somoza, Nasser, The Shah, Idi Amin, Sadam, Pinochet and so many more? The Martians? But that's stuff to talk about in a different thread. You seem to hate these axis pilots.Why is that?They are no different than the allied pilots. Wow, Ken ! You don't seem to see the difference between right and wrong! It's kinda difficult to explain in this forum but let me ask you a question: is there a difference between the 19 Arab airplane hijackers that crashed their aircraft into the Pentagon and the Twin Towers and the American jet fighters that bombed the presidential palace of Gaddafi in Libya? Basically both attackers only followed orders, right? How about the airplanes that bombed Pearl Harbor compared to the airplanes that dropped the atomic bombs on Japan? They only did their job, nothing else. They all obeyed orders, right? We are not allowed to be so simplistic if we want to have an intellectual and serious debate. Look, we have a world order and we have societies that are build in a certain way. When those societies don't conform with living in peace with their neighbors or don't accept an "establishment" that proved to be successful for a long period of time, those societies will be punished by the rest of the world. Everybody wants the existing, the established world order, the "status quo" mainly because it proved to be peaceful, safe, secure, and stable. Hitler with his followers went against that world order and tried to impose a new world order, the one of the superior race, the Aryan. He tried to impose this new world order by conquering well established societies and killing millions of people that wouldn't "fit" in his understanding of the superior race. He used many followers to accomplish those goals, among them those "aces" of the air war. That's why those "aces" of the Luftwaffe are no aces but plain murderers, unscrupulous and premeditated murderers. They followed a political and racial philosophy and a leader that was obviously mistaken and sick. Be rest assured, you wouldn't have conformed with their acceptance. The people that started to oppose them and finally to fight them were only defending what proved over the centuries to be good, the "status quo" and that's why those are not considered murderers but freedom fighters, soldiers of liberty and freedom, protectors of democracy and individual rights. That is the difference between RIGHT and WRONG! Ken, reading this posters comments it is quite obvious that they are young, and perhaps just reading history books. It's unfortunate that they have chosen to spend so much time arguing logically incorrect points, always with emotional rancor. You can't really do anything other than read, laugh, take a breath, and skip over the rest of the sadly long diatribes. People on this thread seem to be very bothered by the pilots descriptions as being 'ace' and I don't understand why. Yes I have read peoples comments and their reasoning but it still doesn't make complete sense to me why the word 'Ace' is being scrutinized. Surely the description of 'Ace Pilot' is in regard to their ability and skill as pilots, not alluding at all to morality or why they're doing it. You can say Genghis Kahn was a brilliant equestrian and archer but at the same time abhor him for what he's used those skills to accomplish. That's right! Your example is perfectly applied in this discussion. Genghis Kahn was an abhorent character for what he did to humanity and the credits he MAY deserve for being a caring father or an excellent cook are totally irrelevant in comparison. 2 - They were out only to kill as many enemies (probably equaly skilled as them) as possible, including Americans and/or European civilians. You and others here don't seem to see that the way those Nazis are being described by this archive (and its anonymous editor) is equivalent to vindicate, excuse and justify all those Genghis Khans. I see so many comments here full of hate for these pilots, but also for the person who posted this picture. Being a History (and mostly WW2) amateur, I am actually upset by how people can be so brainwashed to the point of criticizing the title of Aces these men won. I am a pilot too, and respect these men, as well as all of the fighter pilots, Aces or not. It takes a lot of skill and courage to be able to fight in the air (mostly during WW2, where missiles were not yet available for VBR kills) let alone surviving for that long. And yes, these men killed many other pilots and crews. But then again, their counterparts would have gladly killed them the occasion had arisen. To me, it is funny how people here can criticize this, but surely would be the first ones to shoot another human being to preserve their lives. The examples taken in some comments are completely ridiculous, so I don't even need to discuss them... Any person with a well formed brain will realize. Once again, I will state this: These pilots deserve the title of Aces for their skills and courage. The moral concept of their acts is another side of the story. There are no rules in a battlefield. These men were nothing more than skilled pilots, who were unfortunately caught in a War. As well as their counterparts who, morally speaking, were not better, nor worse. This german airforce aces didn't got the absolute highest award. The absolute highest award was: "Golden Oak Leaves with Sword and Diamonds to Knight-Cross of Iron-Cross". Only ONE TIMES given to german airforce colonel "Hans-Ulrich Rudel" in december 1944. You can not blame a group of people for wanting world power it happens today and it will always happen. U.S. regime has killed 20-30 million people since World War Two. This study reveals that U.S. military forces were directly responsible for about 10 to 15 million deaths during the Korean and Vietnam Wars and the two Iraq Wars. The Korean War also includes Chinese deaths while the Vietnam War also includes fatalities in Cambodia and Laos. The American public probably is not aware of these numbers and knows even less about the proxy wars for which the United States is also responsible. In the latter wars there were between nine and 14 million deaths in Afghanistan, Angola, Democratic Republic of the Congo, East Timor, Guatemala, Indonesia, Pakistan and Sudan. But the victims are not just from big nations or one part of the world. The remaining deaths were in smaller ones which constitute over half the total number of nations. Virtually all parts of the world have been the target of U.S. intervention. The overall conclusion reached is that the United States most likely has been responsible since WWII for the deaths of between 20 and 30 million people in wars and conflicts scattered over the world. Every single American president is murderer and war criminal. that Nobel piece price winner started 5 wars in 5 different countries, killed probably million people in last 5 years and you are calling Stalin murderer. These are not just soldiers who carried out orders and their soldier's duty. They personally have a tremendous responsibility for the destruction of millions of people by the Nazis. They were symbols of Hitler's Germany. Commanders especially for propaganda inflated their combat account. They bathed in glory. And they liked it. Simple soldiers are those who froze in the trenches on the Eastern Front, getting mobilized. Or those who perished in the attacks in the Ardennes. And these Nazi pilots had a choice - to be Hitler's stars and to kill, romantically sowing from the sky destruction and pain, or "get out of the fight." They made their choice. And their place - next to Himmler and Goering at the trial. It's the Nazis, who have quietly lived their life. My grandfather is a Hero of the Soviet Union, a fighter pilot. He fought in the sky with many of them. He sent down 39 people like them from the sky. As a result, from all these illustrious Aces there was not a trace in the sky. Here he is worthy of respect, and they are contempt. After reading the book, "A Higher Call" by Adam Makos, this photo has so much more significance. I highly recommend the book to those who seem outraged and can't understand how anyone could post this historical photo. The book explains how no one in the Luftwaffe with the exception of Goering would ever be tried for war crimes. They considered themselves gentlemen with a high Code of Honor to keep no matter what. Most of them hated Hitler and the Nazi Party. In fact, Galland's "Squadron of Experts" mentioned in the description of the last man in this photo was made up entirely of Aces (some in this photo) who had fallen a foul of The Party. Also, in Nazi Germany, service in the military was not a choice. Finally, these pilots were respected by their Allied counterparts who also killed as part of their job given them by their respective Governments. These men did not start the War or make the decisions, they just did the job that they had to do or else get killed. Many became freinds after the War as described in the book I mentioned. Perrete, you have no clue, these are aces, they reallyy are HEROES, they are not bombers, so your pathetic atempt to compare them to bombers of Pearl harbour or Hiroshima are totally off, these aces hunted dwon allied bombers and warplanes trying to attack their country.